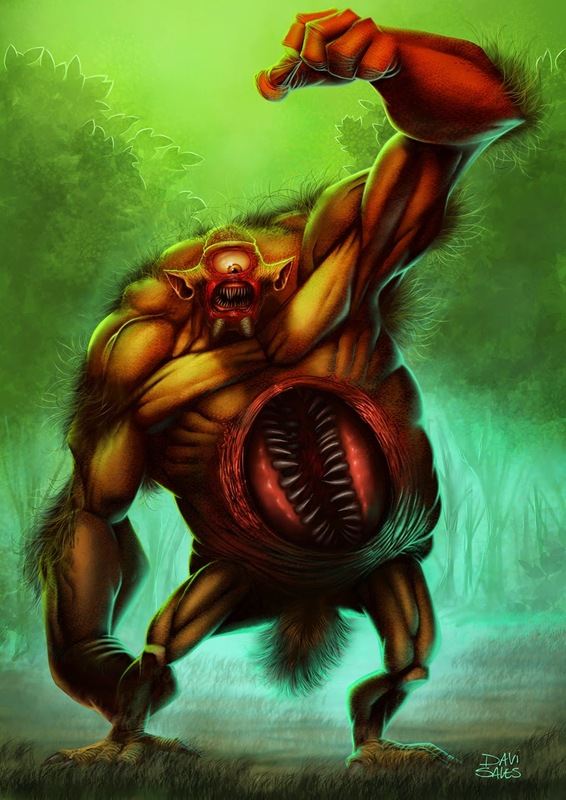 The mapinguari or mapinguary, also known as the Isnashi, is a legendary cryptid said to resemble an ape–like creature with red fur living in the Amazon rainforests of Brazil and Bolivia. The name is usually translated as “the roaring animal” or “the fetid beast”. According to native folklore the creature has a series of unnatural characteristics related to other fantastic beings of Brazilian mythology. These include the creature only having one eye, long claws, caiman skin, backward feet and a second mouth on its belly. In more recent eyewitness accounts it has consistently been described as resembling either an ape or giant ground-dwelling sloth and having long arms, powerful claws that could tear apart palm trees, a sloping back, reaching heights of 7 feet when standing on its hind legs and is covered in thick, matted fur. According to legend, it is slow but ferocious and very dangerous due to its ability to move without noise in the thick vegetation, surprising the unsuspecting locals. 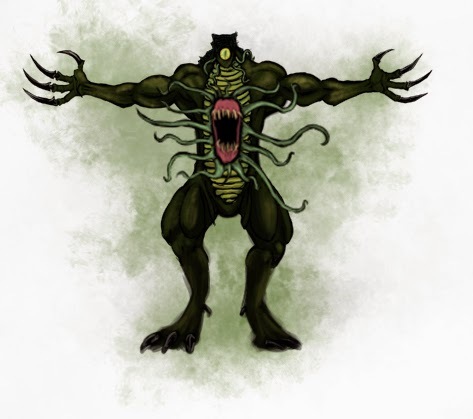 Accounts state that it gave off a putrid stench and emitted a frightening shriek, and that weapons such as arrows and bullets could not penetrate the Mapinguari’s alligator-like hide. Its only known weakness is that it avoids bodies of water, which limits its movements in a region where so many rivers, brooklets and lagoons exist (especially during the rainy season). It was believed to be carnivorous, as a 1937 report from central Brazil claimed a Mapinguari had gone on a three-week rampage, killing over 100 cows and ripping out the tongues from their carcasses. However, in all accounts it did not eat humans, although when it smells the presence of people it stands up on its back feet, becoming as tall as two metres, a movement similar to grizzly bears. 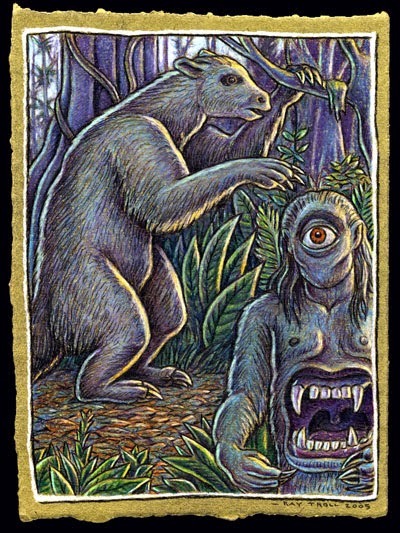 Many cryptozoologists are intrigued by reports of this creature, though some have dismissed it as a folkloric/mythologic creature, or a long-preserved folk memory of the giant animals that existed in South America in the Pleistocene. Theories of the identity of the Mapinguari have suggested that it was a giant primate, a giant ground sloth (most likely Megatherium and Mylodon), or possibly even an unusual giant anteater, perhaps Myrmecophaga tridactyla. The ground-sloth theory can provide an explanation for its supposed bulletproof hide, as preserved ancient skin samples in the late 19th century revealed hard dermal ossicles, small pieces of bone in the skin of dinosaurs and alligators that protected them from predators. It is possible that such skin would have been impervious to arrows and bullets. 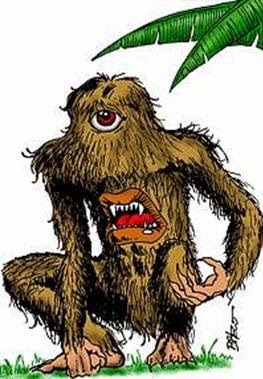 Despite several efforts, searches for verifiable physical evidence have been futile, as the only evidence for the existence of the Mapinguari is anecdotal. Among the many researchers who have tried to find evidence for the existence of the Mapinguari is the ornithologist David Oren. During his various expeditions, he has collected a range of material some of which was later shown to be agouti fur, anteater feces, and casts of tracks that were inconclusive. Nevertheless, Oren still considers the creature to be real, but highly elusive, and nowadays extremely rare, avoiding contact with humans whenever possible. 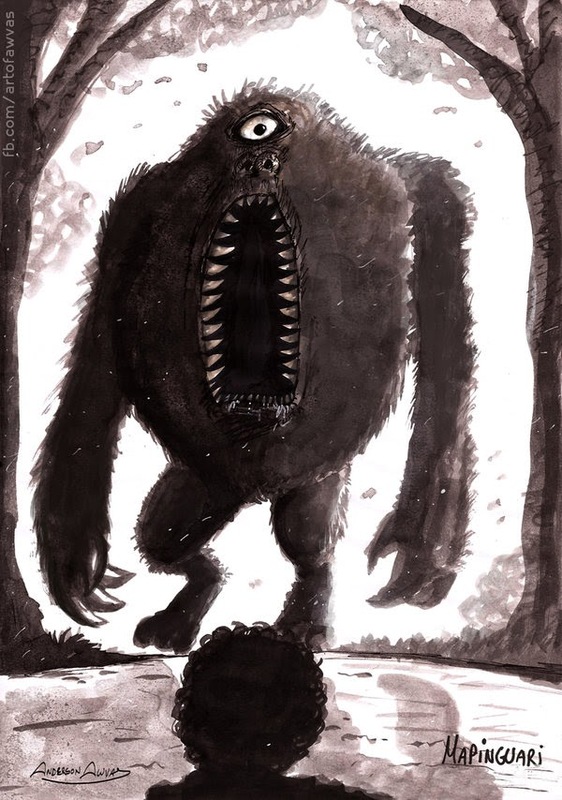 When I see pictures of the Mapinguari it reminds me of kids drawing monsters with it's backwards feet and chest/mouth, in my opinion it's a great folklore tale and nothing more.